We Make Ideas Happen. 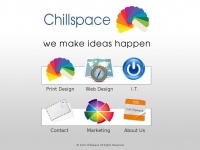 Chillspace is your one stop source for Print Design, Web Design, Marketing and I.T. Consulting. We use our experience in marketing and apply it to our design work to assist you in moving your business forward. The web server used by Chillspace.ca is located near the city of Burnaby, Canada and is run by In2net Network. This web server runs a few other websites, mostly in the english language. The websites of Chillspace.ca are served by a Apache server. The markup language of the website is XHTML 1.0 Transitional. The visitor analysis software Google Analytics is used to analyze the visitors of the websites. The website does not specify details about the inclusion of its content in search engines. For this reason the content will be included by search engines.